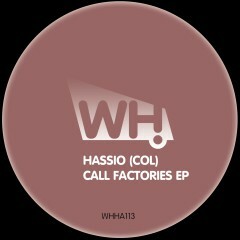 One of Columbia’s finest producers, Hassio (COL) joins the already impressive What Happens roster and brings us his Call Factories EP, a seriously cool 2-tracker of proper underground house. His recent work includes tracks on established imprints like Antura Records, Witty Tunes, Frequenza and Pild Records to name a few. He constantly proves he loves what he’s doing and his workflow is up there with the best. Mark our words, his star is about to blow up in 2016.